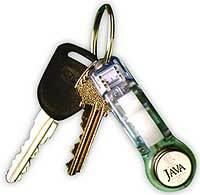 Dallas Semiconductor announced the DS1957B Java-powered iButton, a circular half inch (16mm), steel-encased computer with 64 kbyte ROM and 134 kbyte RAM that you can attach to your keyring. That's more storage than an Apple II+ computer WITH a memory expansion card - and it fits on key fob!. Capable of storing over 30 digital certificates with 1024-bit keys using ISO X.509v3, the most widely recognized public-key certificate format. This little device can be a physical key for touch and go access to buildings, a computer key for secure network log-on or act as an e-signature for the Internet. Even your usernames and passwords, color ID picture and application programs of different service providers can also be stored. Now all the technology-based credentials of an individual can be easily stored and moved WITHOUT any need for biometrics! While this device is tiny, it is both cryptographically and physically secure. This steel-armored chip has been wear-tested and should have 10 years up-time. If that's not enough, the firewall of the iButton prevents access to the private keys, in case the device is logically attacked. Cool, a firewall in your pocket. If it is physically attacked, the iButton has a tamper response that erases the private key instead of revealing it, in order to preserve confidentiality. These protective measures comply with United States Government specifications for secure e-commerce under the NIST FIPS 140-1 cryptographic module validation program. Along with the strong 1024-bit keys for secure log-on, this Java-powered iButton has a true time clock inside its cryptographic boundary for time stamping the e-signatures that are now legal, under US and some foreign laws. OK, all this sounds great - how much is it you ask - suprisingly, this technological marvel is only $32 in quantities of ONE! Wow!